If you're looking for a reputable Toyota dealership that serves Murrieta, CA drivers and boasts competitively priced 2019 Toyota Corolla models for sale, head to Gosch Toyota! We offer driver-centric experiences that are customized to suit your vehicle search requirements, and thanks to the credit professionals over in our finance center, drivers can secure the Corolla financing assistance they're looking for. Get a feel for the 2019 Toyota Corolla lineup now, shop Gosch Toyota's inventory online from the comfort of your Hemet, California home. If you are looking for a sedan that boasts both a sporty design and a high-level mpg then look no further then the new 2019 Toyota Corolla. 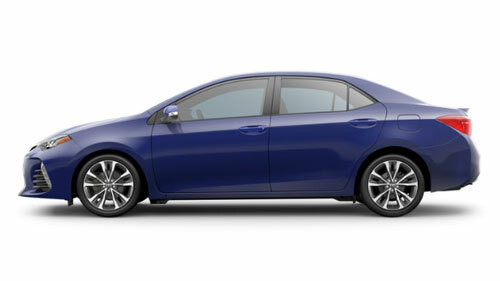 The Corolla comes with an aerodynamic design that has been tested for optimal performance. Plus, the estimated 40 mpg rating is enough to get drivers to start thirsting for adventure, not fuel. Those drivers interested in upgrading to the new 2019 Toyota Corolla should visit our Gosch Toyota dealership near Murrieta and Moreno Valley, CA. Contact our sales team to set up a test drive and discover these features first hand. Drivers of the new 2019 Toyota Corolla are excited by all the new technological features now available. From the integrated backup camera to the Entune™ Audio Plus features, this new Corolla is ready for all those weekend drives. Experience Corolla drivers are also excited about the available 7’’ high-resolution touchscreen with Siri® Eyes Free features. These feature and more are available on the new 2019 Toyota Corolla, visit with our finance team to learn about our Gosch financing. Our finance team works with many different creditors to find the most competitive loan available to you. If you are looking to finance the new Corolla, visit with us today! Our Toyota sales department is eager to introduce you to the 2019 Toyota Corolla trim models that satisfy your vehicle requirements, so don't hesitate to make your way over from Menifee, CA to our convenient Hemet location today! Our sales team is highly trained in all the Toyota Corolla trims and are able to answer any questions you may have. Drivers who visit us understand that we offer a complete car buying experience that includes financing assistance and future maintenance; get in touch with Gosch Toyota to learn more or explore our resources online now!